Montgomery (February 11, 2019) – A serious head-on collision in Montgomery left one person killed and two people in critical condition. The car accident occurred Sunday afternoon around 1:00 p.m. at the 21000 block of Eva Street. The driver of a Dodge pickup truck was heading westbound and crossed the center line colliding with the Kia SUV traveling eastbound. When the police arrived to the scene of the crash, they found the Kia with four people trapped inside. The front seat passenger died at the scene. The driver and three passengers were rushed to the hospital in critical condition. 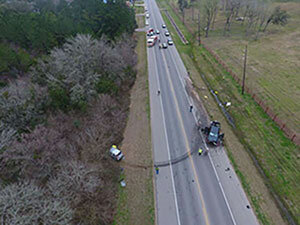 The unidentified driver of the truck suffered lacerations during the crash. Authorities found several pill bottles in the truck and he will face possible charges. Investigators said the crash was a result of a wrong-way driver. If you or a loved one were involved in a car accident, it is important to contact a legal expert to help you evaluate your options. Call (713) 987-7111 or send us an email send us an email to discuss your car accident injury case.